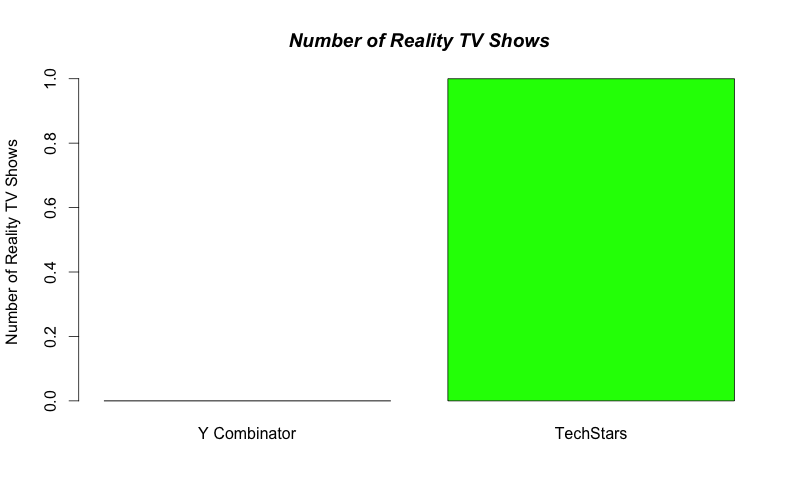 Y Combinator Vs TechStars: Whose Companies Are Bringing In More Funding? Y Combinator and TechStars are two of the first seed-stage venture funds, and they’ve each had some successful companies. But how can we analyze how they’re doing so far? One way is acquisitions, but there’s not always complete information about who sold or for how much (and anyway, most of them haven’t sold yet). Another metric would be valuations — are companies becoming more valuable over time? — but we also don’t have good access to that. What we can do is look at the amount of money raised by the companies that participated in these programs. This is not a perfect metric of success, but it’s an interesting enough signal because most of these companies need funding during their early stages as they build their products and find markets. If they are making enough progress, investors will put in more money. Here’s a closer look, using data from CrunchBase. Note that both programs have been operating for rougly the same span of time — Y Combinator in 2005 and TechStars in 2006. Y Combinator is growing the size of its classes almost every year. There are two times more companies at it than at TechStars companies, based on the dataset. Quantity does not necessarily reflect in the quality of the portfolios, so let’s keep digging. Raising a lot of money is not my definition of success, but it’s a good indication of the health of a startup in a lot of cases. 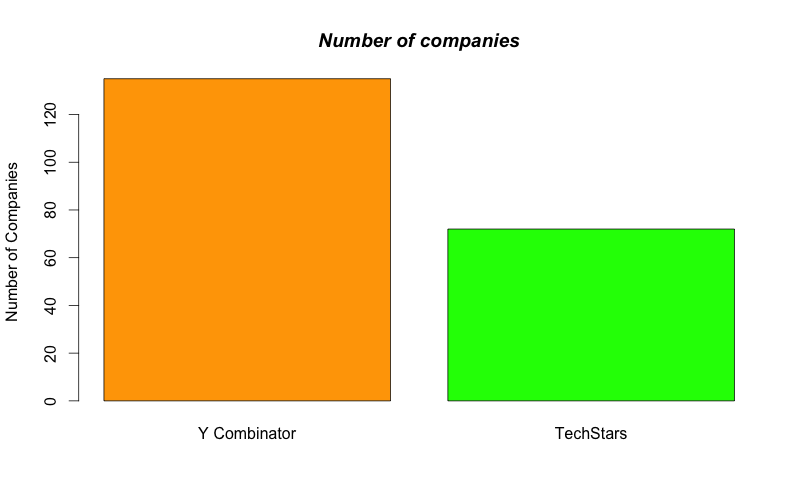 Y Combinator companies as a whole raised ten times more money than TechStars companies, according to the data. Part of the reason for this great distance are the massive rounds raised by DropBox and AirBnB. Those companies distort the data, yes, but that’s quite relevant: seed-stage investors want the huge hits. But in terms of how more typical startups do, the ability to raise rounds of funding shows they’re both doing about the same. 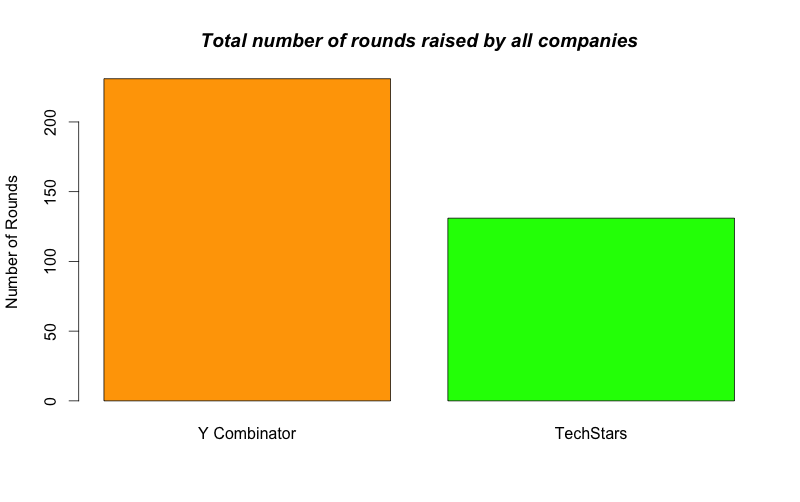 While Y Combinator has more total rounds raised, but it also has more startups. To look at how the average company does, though, we need another metric. So, we computed the median amount raised by companies in the subsequent round after the acceleration process. 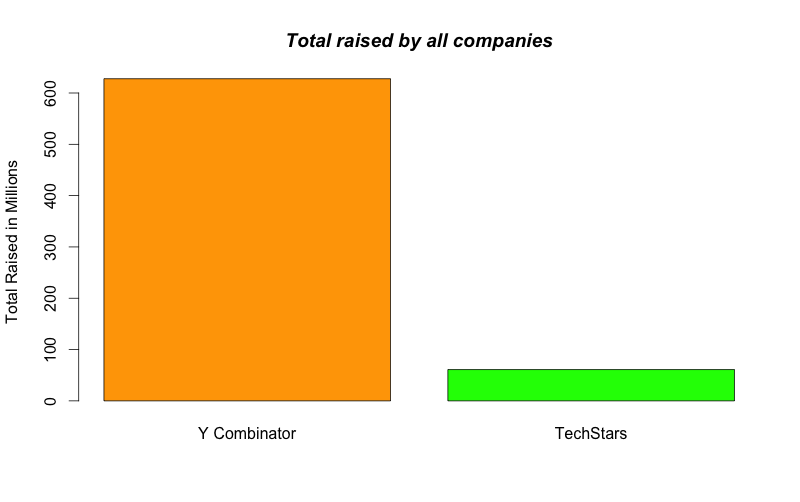 Half the Y Combinator companies raised more than $800,000 in the next round and half raised less. Half of TechStars raised more than $500,000, half less. 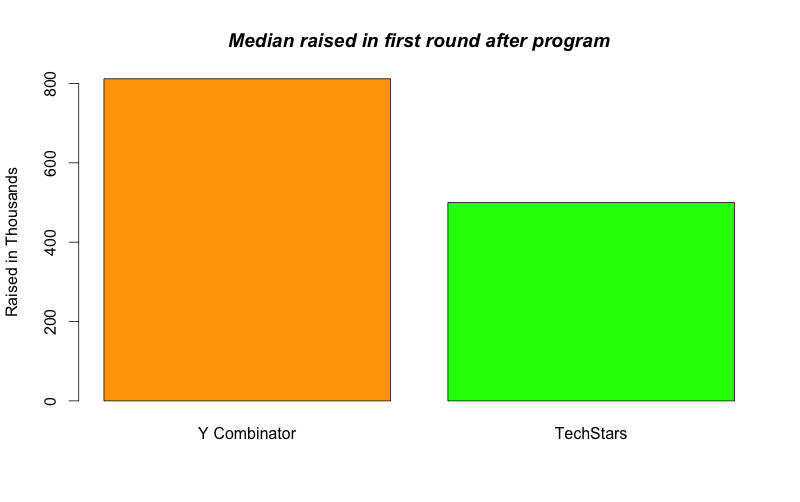 In other words, Y Combinator companies appear to be valued more highly than TechStars by early-stage investors. Before you read too much into that, remember that other factors can impact this metric, too — the types of companies funded by each accelerator, the proliferation of deal-hungry angels near the program, etc….